For patients recovering from surgery, sports injury or dealing with chronic pain in their ankles, knees, backs, shoulders, or wrists, finding the right treatment is integral to relieving pain and getting back to regular daily activities. With so many items out there on the market it can be difficult to select the right product for your specific needs. The Breg Polar Care Kodiak cold therapy unit is a portable motorized cold therapy system that provides penetrating and long-lasting pain relief. The Breg Kodiak is durable and compact, making it easy to use at home, at work, or anywhere else that you have access to a power outlet. The motor is very quiet so when it’s running you may not hear it, but when you feel the pad compress slightly you will know that the system is working properly. If you experience any condensation on the hose you can wrap the hose with a towel. If you need to ambulate you can unplug the AC adaptor from the wall and then separate the pad coupling from the hose coupling. Water will not leak out when the two are separated. The Breg pads are actually “inteliflow” pads, which means that a restrictor valve at the end of each pad controls the speed of water circulating from the cold therapy unit through the pad to provide the safest water temperature for the body part that you are icing. For extremities (hand, wrist, and ankle) the water is circulated at a slower speed, allowing the body to warm the water some and prevent the area from getting too cold. For areas of the body closer to the core (hip, shoulder, back, and knee) the water is circulated at a faster speed, leaving the water cooler. What this means for you is that it takes the guess work out of using the unit and ensures your safety. When evaluating pain relief products the two most important things you should look at are effectiveness and value. 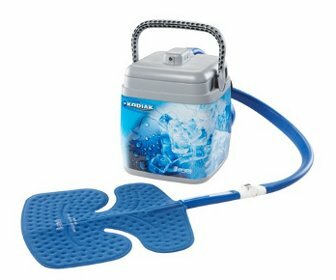 The Breg Kodiak cold therapy unit is probably the most effective cold therapy unit on the market right now- providing hours of deep penetrating pain relief for both post op patients and individuals with acute pain. Unlike ice packs, cold therapy units provide long-lasting pain relief and eliminate the hassle of waiting for them to freeze and changing them out several times an hour. With the Kodiak you also have the added benefit of an "ice strainer" embedded in the water/ice chamber. This simple, but highly effective, feature allows ice to remain inside when dumping out water in order to save as much ice as possible when refilling. The superior pain relief that the Kodiak provides can improve sleep, restore range of motion sooner, and reduce the need for pain reliever medication. In terms of value, the Breg Kodiak is a great value because it is so durable that it will last for many years of usage. One of the features that helps extend the life of the Kodiak is the unique filtration system that can be easily washed out of it ever gets clogged. Many other continuous cold therapy units out there can’t be cleaned out properly to ensure that they will continue to work properly over the years. Additionally, the Breg Kodiak has the strongest and quietest motor of any portable motorized cold therapy unit available. This high quality motor is another reason that the system is so dependable and is preferred by so many patients and doctors. About the Author: MMAR Medical Group Inc. is one of North America's premiere medical brace distributors. Based in Houston Texas, MMAR specializes in orthopedic braces, splints and supports, as well as diabetic footwear and cold therapy units.